Although Carlotta is a model here for so long, we didn’t make that many series. Mainly due to the local distance we have and Carlotta was a long time in USA as well. For this Archive Pack I chose three mind-blowing sets, all of them are featuring Carlotta in nylons and different shoes. In the second set “Dangle Pop” Carlotta was also wearing sweaty nylon socks, but this time with veeery old sticky flats. The inside of the sole was just awesome! 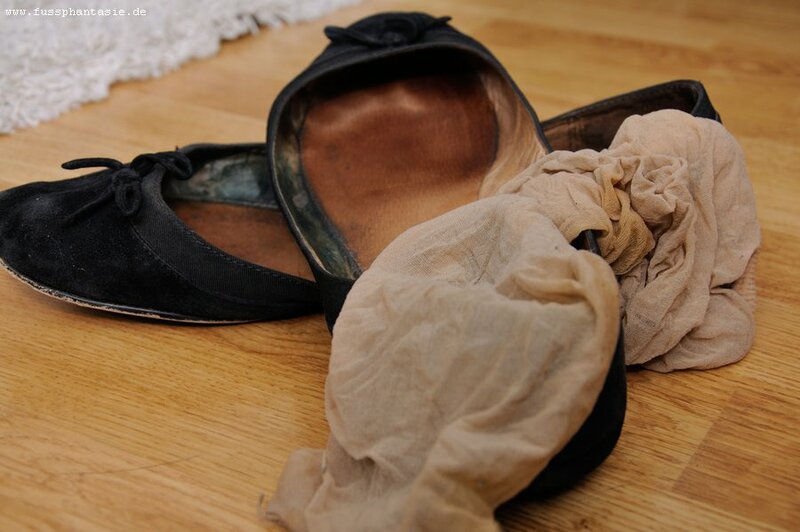 There was a “victim” who had to remove the stinky nylons while I was at the camera. Poor camera guy in that case, because I would have liked to change the roles. The last series is called “Clogpop” and the name speaks for itself. Carlotta had wooden Dr. Scholl’s mules and was wearing – beware! – tan nylon socks. She cleaned the table in her kitchen, played with her toes, smoked red Gauloises and crushed the stub at the end with the sole of the clogs. Wow. All in all you’ll get 286 photos with wonderful trashed and sweaty nylons in different combinations. You can’t resist Carlotta, I’m sure. For a long time she was the leader of the “scent scale” in the shop!